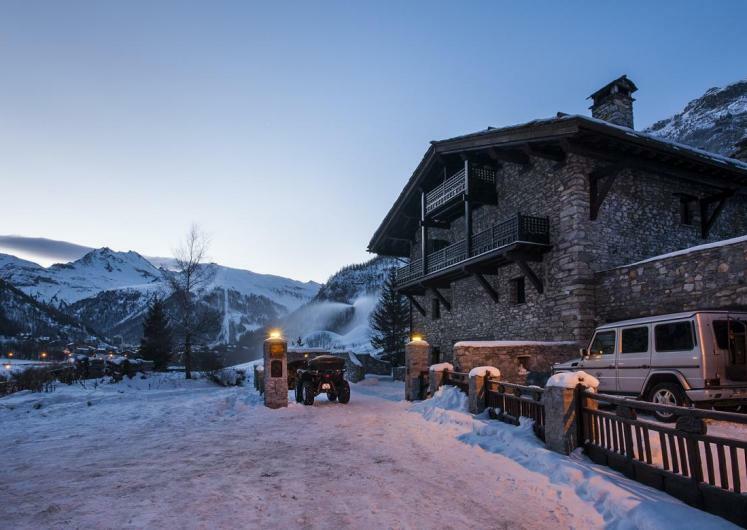 The hamlet Petit Alaska is located 350m from the centre of Val d’Isere and a 5 minute walk from the slopes. Chalet Husky is simply unlike any other chalet you have ever seen before. It's a triumph of unique contemporary interior design, coupled with traditional chalet elements, which results in the most mind blowing property that you simply won't want to leave. From the minute you enter the chalet, prepare to be wowed on every level. The vast open plan living space spans the entire length of the chalet, from the dining area complete with bar area at one end situated over the glass walkway - suspended above the indoor atrium garden, to the lounge area, flanked with vast brown leather sofas in front of the large open fireplace. Quirky and interesting artefacts and objects d'art are peppered throughout the chalet, both old and new, each unique in style. The lighting in the chalet adds an extra dimension, from the coloured uplighting in the atrium to the full spectrum of rainbow colours above the pool. Pay special attention to the lightshades - a nice touch of vintage meets contemporary. The action can continue off the slopes thanks to the incredible array of facilities that Husky has on offer. The wellness area is quite simply one of the best we've ever seen in a chalet. From the vast 32m² swimming pool with infinity waterfall, to the sauna, hammam and automatic massage tables - there's no excuse for aching muscles, not to mention the fitness room for those needing that extra bit of a workout! The seven bedrooms have been cleverly designed to ensure that everyone benefits from natural light. Each has an en-suite bathroom, two with baths, and every bedroom has a TV. Six of the seven bedrooms are on the ground floor and the master has its own access into the wellness area. Chalet Husky has parking for up to three cars in two garages and the ski room is located in the garage area. Prices are based on exclusive occupancy of the chalet for 14 adults to include full gourmet catering, complimentary drinks and an in-resort driver shuttle service. No travel included. The chalet is also available on a bed and breakfast or flexi-catered basis, please enquire. If you are looking for a family friendly ski chalet, then a stay in Chalet Husky could be the perfect option for you and your family. The operators of this chalet are specialists in providing hassle-free luxury family ski holidays. Everything on your holiday will be focused around ensuring that adults have fun but kids have even more fun. Dedicated Nannies can be hired to ensure that your children are looked after from the moment you step into your ski boots to the moment you unclip them at the end of the day. Whether that be in the chalet or in their own exclusive kids club in Val d’Isere. If Mum and Dad fancy a night to themselves on one evening then babysitters can be arranged to look after the children and put them to bed. On arrival you can expect nappies, children’s toiletries and toys to be laid out waiting for you; there is no need to add an extra check in bag just to take these essentials. Luxury ski holidays with children needn’t be stressful and with this dedicated luxury family ski holiday specialist there is absolutely no reason why it should be. Our team pride themselves on ensuring that service is seamless and anticipating your every need. Your private chef will serve mouth-watering dishes from a menu tailored to your tastes. Your host will manage your whole holiday, from restaurant bookings to ensuring a smart 4 wheel drive vehicle is ready to take you skiing and keeping your glass topped up with a carefully chosen wine or a perfectly mixed gin & tonic. Breakfast and afternoon tea is served daily with pre-dinner champagne and spirits followed by gourmet dinners with wine on six nights. Our driver service offers a fleet of vehicles to whisk you to and from the slopes. We offer our renowned chalet service in all our chalets in Val d’Isère, Courchevel and St Anton. With nearly 30 years’ experience under our belt, we still continue to refine our service to deliver the very best. Whether you are a couple, family or larger group, our aim is to deliver impeccable service, mouth-watering delicious food and exquisite wines in the sublime comfort of your luxurious home-from-home in the mountains. The majority of our chalets come with hot tubs or indoor swimming pools, adding that extra touch of luxury – a ‘must’ on any ski holiday. Our team has first-hand knowledge as we make sure everyone visits the places we sell and know our properties and the local area inside out. We believe in value for money. We do not promise to be the cheapest, but you will not pay over the odds and our quality of service and expertise makes our value for money hard to beat. The best people to recommend us are our guests, which is why our finest endorsement is winning the Condé Nast Traveller Readers’ Awards 2014 – as voted for by them! This property will be quoted and charged in Euros.